Pro-Somali government soldiers backing by the neighboring Kenya forces were reportedly advancing to a new Al-shabab stronghold in Gedo region of southwestern Somalia, reports said Wednesday. Local residents say, the allied forces from Somalia and Kenya are preparing to attack in the coming hours on Wednesday Burdubo village, one of the key Al-shabab bases in Gedo region- a step that forced hundreds of villagers to flee from their houses in fear of fierce fighting between TFG, Kenya army and the militants. Al-shabab fighters in Burdubo village were also reported to have been vacating from the area as the military exercises intensified in the past few weeks in Gedo region. 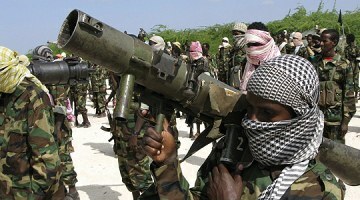 This move followed after Somali government retook control of Beled-Hawo, Luq and El-wak towns from Al-shabab militants. The fall of these towns into Somali government hand is described to be a major loss to Islamist militants of Al-shabab who have been loosing ground since their withdrawal of the capital, Mogadishu last august in 2011.